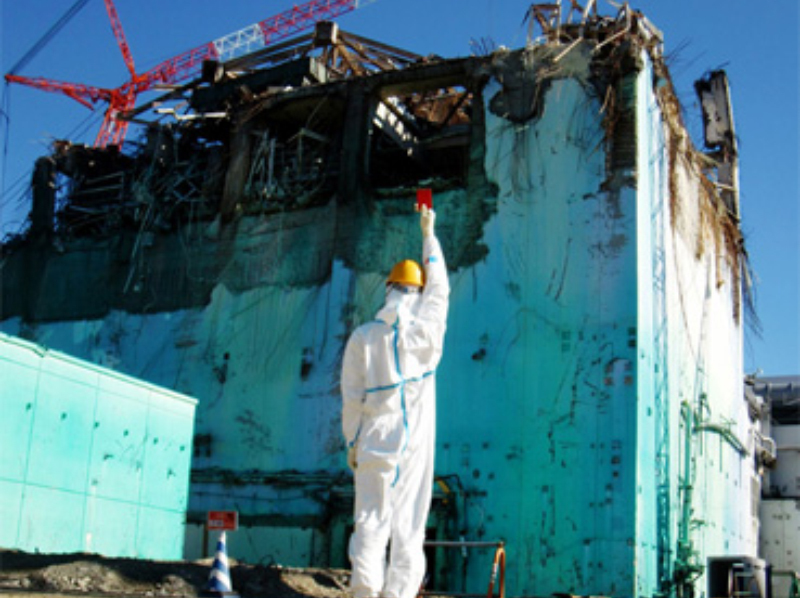 2011年3月11日の東日本大震災と福島第一原発での事故を受けて製作された作品群。巨大な現実を前にアートの無力が語られ、多くの展覧会が自粛された中、Chim↑Pomは現地に赴いて作品を制作。また、渋谷駅に永久設置されている、日本の被爆のクロニクルとも言える巨大壁画「明日の神話」に福島原発の事故の絵をゲリラで付けたし社会的事件を引き起こした。それらで構成され、5月に自主開催した「Real Times」展は、日本における震災・原発事故への代表的なレスポンスとして、特に海外で報道された。 REAL TIMES is a series of works produced in response to the Great East Japan Earthquake on March 11, 2011, and the following accident at the Fukushima Daiichi nuclear power plant. Facing such overwhelmingly gigantic events in reality, people unanimously of powerlessness of art here and there while a number of exhibitions were cancelled as something impolite, against which ChimPom departed to the accident site to produce works. 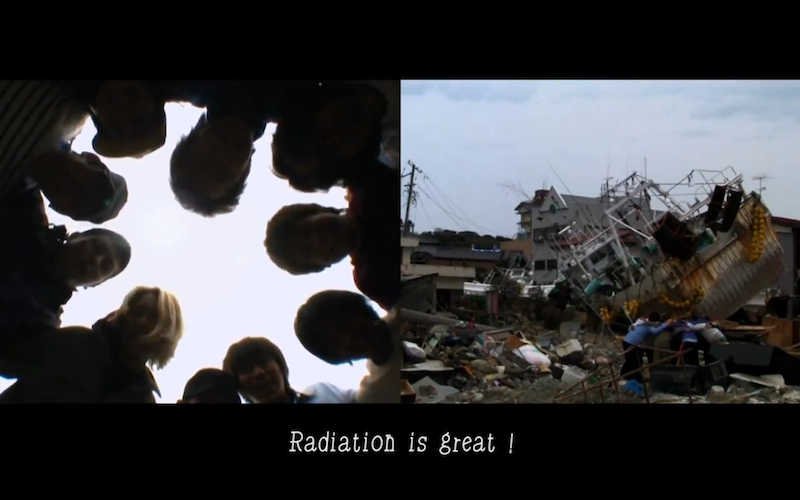 Chim↑Pom also triggered a social phenomenon after posting a panel depicting the nuclear power plant accident next to "Myth of Tomorrow" by Taro Okamoto, a huge mural permanently installed in Shibuya station and seen as a chronicle of nuclear exposure experiences of Japan. "REAL TIMES" exhibition was held independently in May with these works and eventually reported in many countries as the representative response to the quake and nuclear accident in Japan. 〈3.11〉から1ヶ月後の4月11日、原発事故によって無人の街となった警戒区域に入り込み、福島第一原発から約700メートルにある東京電力敷地内展望台に登頂した。東京電力発表の放射線量は、199マイクロシーベルト/毎時。正門付近に車を停めて、片道約20分のトレッキングで向かう。初日の出のスポットとしてPRされていた展望台からは、白煙を上げる4号機建屋と、大量の汚染水が流れ出た太平洋が見えた。そして、展望台で広げた白旗に赤いスプレーで日の丸を描き、それを放射能マークへと改変。月面やエベレストなど「到達困難」な場所での慣例に倣い、その旗を掲げた。タイトルは、「まさに、いま」という意味の「リアル・タイム」、映画「モダン・タイムス」よろしく「リアルな時代」、そしてニューヨーク・タイムズなどのメディアをもじり、警戒区域内での報道が皆無だった当時の状況に対して、「現実の報道」という3つの意味を併せ持たせた。 On April 11, just a month after 3.11, Chim↑Pom trespassed in high-security areas of towns uninhibited due to the nuclear accidents, heading for a lookout point on the site of the TEPCO (Tokyo Electric Power Company) facility approximately 700 meters from the Fukushima Daiichi Nuclear Power Station. 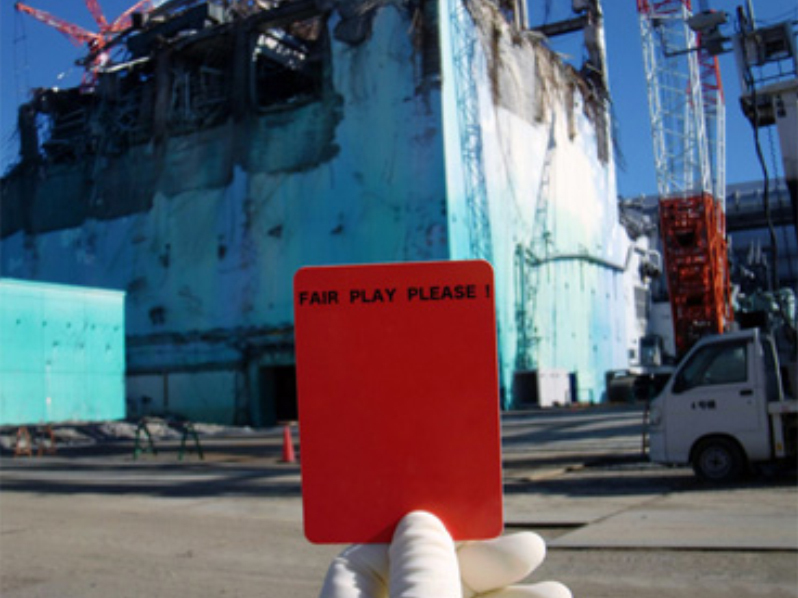 TEPCO had estimated radiation levels to be 199 μSv/hr. Having their car parked near the main gate, Chim↑Pom made a 20 minute trek to reach their destination. 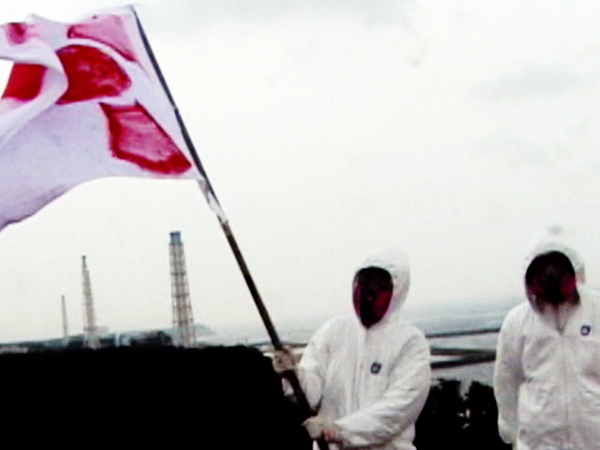 From the top of the lookout, which was previously promoted as a site for the New Year’s sunrise spectacle, was the view of white smoke rising from Reactor 4, and the Pacifc Ocean into which a vast amount of contaminated water was leaking. Chim↑Pom stretched out a white flag, sprayed a red circle on it to resemble the red circle of the Japanese flag, changed it further to a radiation symbol, and raised the flag following the custom of “the pole of inaccessibility” like on the moon or Mount Everest. The title REAL TIMES simultaneously stands for three meanings; as this ver moment “right now,” as a historical time as in the film title Modern Times, and as a media title as in newspapers like The New York Times against the situation where the actual stor of inside the high-security area was never reported through mass media. 福島第一原発の原子炉建屋に近接する畑に設置した、防護服姿の案山子。畑はすっかり打ち捨てられた状態にあった。避難した住民と原発作業員へのオマージュとして制作。 Chim↑Pom installed a scarecrow wearing a protective suit and a gas mask in a totally abandoned farm close to the Fukushima Daiichi Nuclear Power Station, as a homage to evacuated locals and workers at the nuclear power station. 渋谷駅にある岡本太郎の壁画《明日の神話》右下にある隙間に、原発事故を描いた絵をゲリラ設置したプロジェクト。原子炉建屋からドクロ型の黒い煙が上がる様子を壁画と同じタッチで紙に描き、それを塩ビ板に貼ったものを、連続した壁画の一部として自然に見えるように設置した。通行人が撮影した画像がネット上で拡散され、匿名の行為として議論を巻き起こす。個展「REAL TIMES」にて、作品として発表。 A guerrilla style installation project in which a panel depicting the nuclear disaster was added to the existing mural 'Myth of Tomorrow' by Okamoto Taro in Shibuya station. On a paper attached to a PVC panel, the image of rising black smoke in a skull shape was painted in the same style as the mural so that it appeared natural as if being a sequential part of the mural. Initially it was regarded to be an anonymous act, with news of it being spread through internet posts of passers-by, and it triggered controversy. 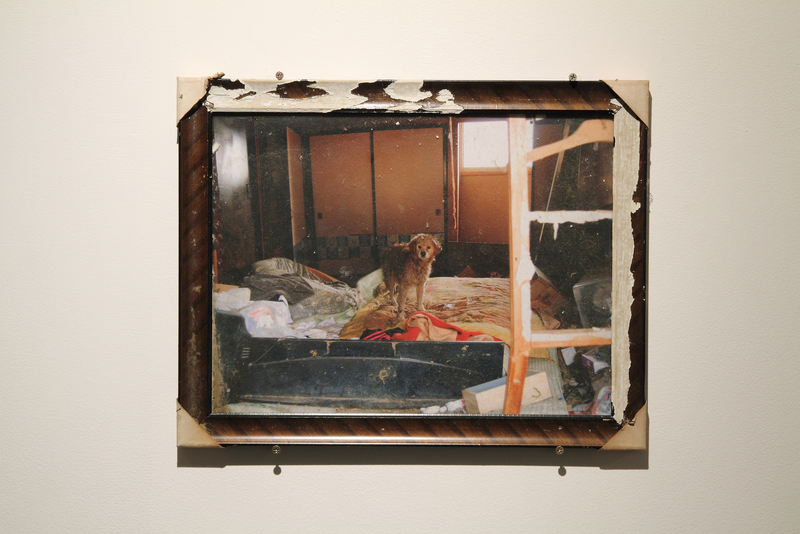 It was revealed as Chim↑Pom’s work at the REAL TIMES exhibition. 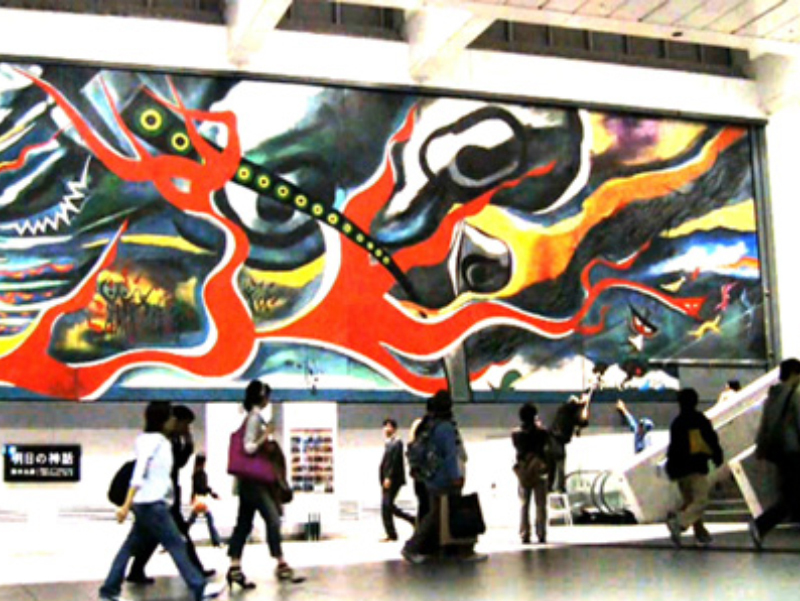 The huge mural Myth of Tomorrow by Taro Okamoto in Shibuya station is a chronicle of the nuclear exposure of Japan.Witnessing the atomic bombing in Hiroshima and Nagasaki and the hydrogen bomb exposure of the Lucky Dragon 5, radiation has traveled through the 20th century and to the present day over centuries, from war to peace, together with the safety myth of the nuclear power plant.Myth of Tomorrow was completed in an unnatural form due to the shape of a hotel where the work was originally located. 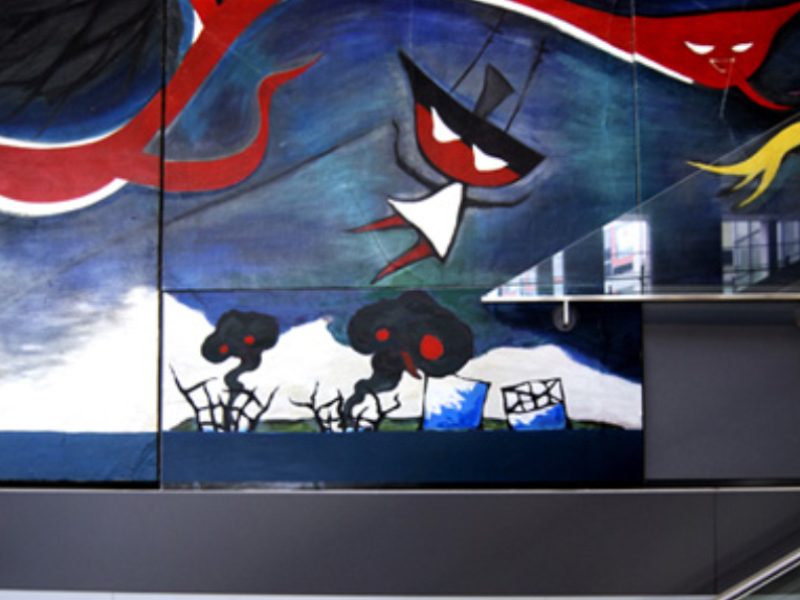 In the mural, the Pacific Ocean, with the Lucky Dragon 5 being exposed to nuclear ash, spans its horizon from under the central figure of a burning man to the lower bottom, where the horizon is interrupted with a blank space.The margin was left as an ordinary wall, providing a prophetic blank to the 21st century. In 2011, reality updated this chronicle. 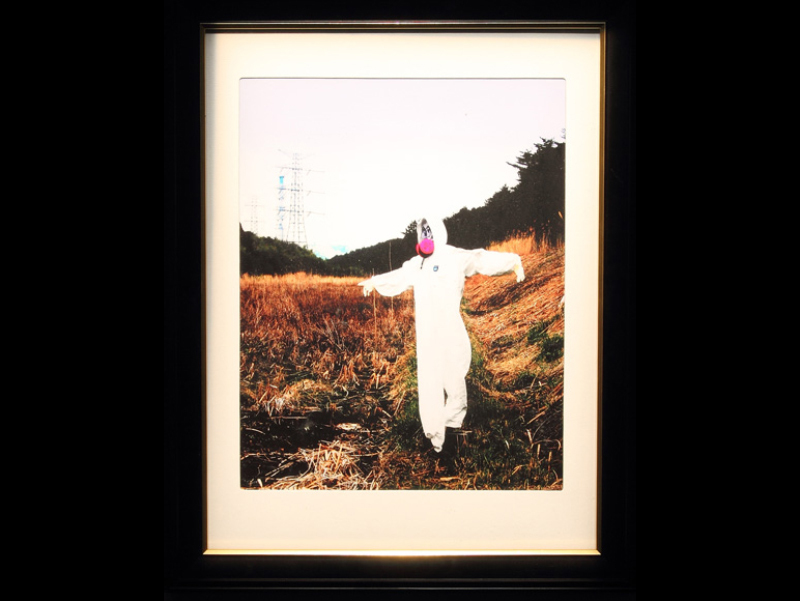 Chim↑Pom added the figure of the explosion at the Fukushima Daiichi Nuclear Power Station to the blank, as a figure “unexecuted” by Taro Okamoto himself and as the reality of all the Japanese people living after Hiroshima. LEVEL 7 feat. “Myth of Tomorrow” will always be together with Myth of Tomorrow forever. To see the work through its absence must require our imagination instead of eyes, just as to conceive of history or radiation We believe imagination is the very possibility for ground zero, and the most fundamental power to create the future. And we believe art exists as such. 2011年5月、福島県相馬市で知り合った若者たちと、 100連発の気合いを入れた様子を収めた映像作品。相馬市は東日本大震災の被災地であり、家を流され、大事な人を失った彼らは、放射能の恐怖のなか、壊滅した街で約2ヶ月間を過ごしていた。報道が集中した被災地と違って、外からのボランティア不足が続いていたが、福島第一原発が近いことも影響していたのだろう。被災者でありながら、自ら救援活動や復興作業にもずっと携わってきた彼らによるリアルな叫びは、すべてアドリブ、一発撮りで収録された。 This video work films Chim­Pom members, together with friends made in Soma city, Fukushima in May 2011, doing 100 sequential yells of “KIAI,” which is Japanese for shouts showing a fighting spirit. 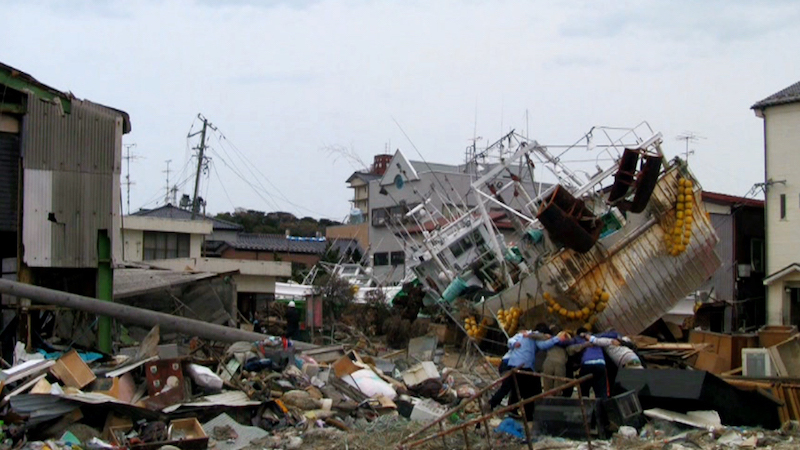 As Soma city is one of the affected areas of the Great East Japan earthquake, these people lost loved ones, their houses were washed away, and they spent over two months in the destroyed city despite fear of radiation. 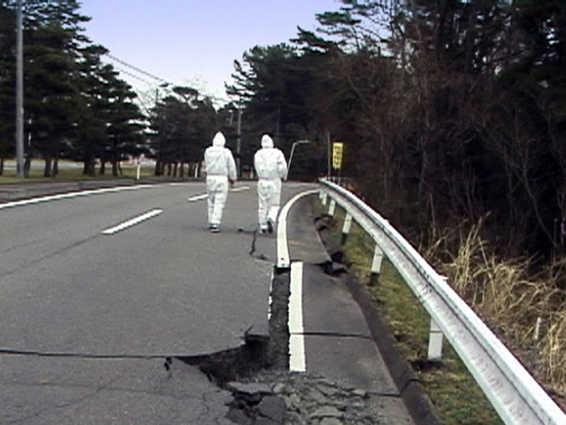 Unlike other areas intensively covered by mass media, this area had suffered from a shortage of volunteers probably due to it being so close to the Fukushima Daiichi Nuclear Power Station. These were real shouts filmed all in one-cut and ad-libbed, by the young locals who, although being victims themselves, had continued to provide relief and help towards reconstruction. 福島第一原発から30キロの警戒地域で採取した植物で制作した生け花。フラワーアーティスト、柿崎順一とのコラボレーション。 In collaboration with flower artist Kakizaki Junichi, this Ikebana [the Japanese art of flower arrangement] is made out of plants found within the 30 kilometer wide high-security area, surrounding the Fukushima Daiichi Nuclear Power Station. 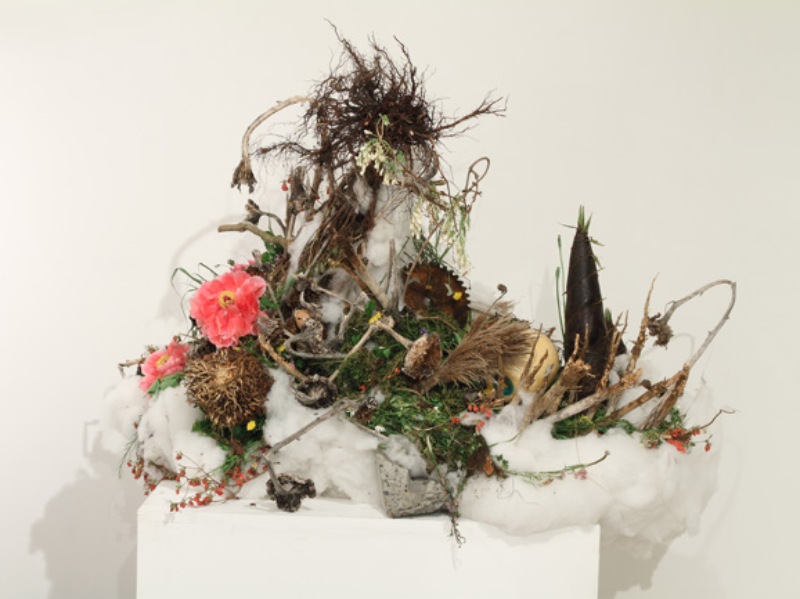 被曝花ハーモニーRadiation-Exposed Flowers Harmony/span> 2011 植物、ほか 2011 plants, etc. 地震で倒壊した家の庭の前で、首輪をした犬が喉を鳴らしていた。数秒見つめ合う。犬はこちらを 気にしながら家の方へと歩き出す。が、すぐに立ち止まってまたこちらを振り返る。目が合うと再 び家へと歩き出す。ついていくと、2階の布団の上に足を怪我した別の犬がいた。器がおちてい て、そこでえさを与えられた形跡がある。水とシーチキンを入れると、犬は足を引きずりながらよっ てくる。やはりお腹が減っていたのかあっという間に食べ終えて、また足を引きながら元の布団に 戻っていった。 There was a dog wearing a collar in front of a collapsed house from the tsunami, growling and staring at us. The dog started walking towards the house while paying attention to us, but, immediately stopped and looked back at us. Looking at us in the eye, the dog started to walk to the house again. We kept following the dog, and ended up finding another dog injured on the second floor. We noticed a bowl nearby, seemingly the dog was being fed. We put some water and canned tuna in it, and the injured dog tries to wriggle and come closer. The dog was starving as we thought, and had eaten up everything in a moment, then went back to his bed wriggling again. 震災後に広島の被爆者団体代表である坪井直氏から送られたFAX用紙を、福島で被災した額縁 で額装した。この言葉は、講演など、折に触れて50年以上使ってきた、彼の座右の銘である。壊 滅と放射能を乗り越えてきた広島で被爆者として生き、自らの死後になるかもしれない核廃絶と いう人類的命題を訴え、そして自らの病魔と闘い続けてきた坪井氏によるこの言葉は、21世紀の 日本にとって重い意味を持つ。 Into a frame that survived the disaster in Fukushima, Chim↑Pom put a fax paper sent from Tsuboi Sunao, a representative of an A-bomb victim organization in Hiroshima. 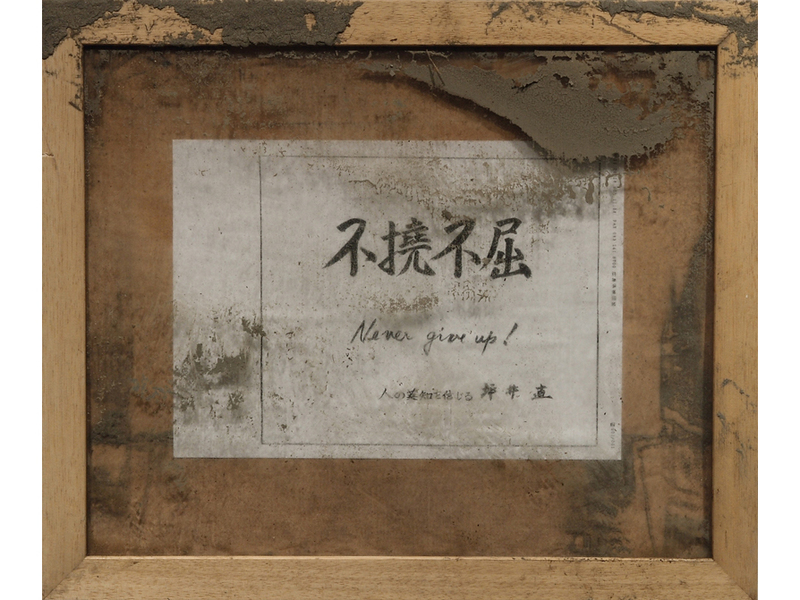 For over 50 years, this has been the motto Tsuboi has used in speeches and during public occasions. As an A-bomb survivor living in Hiroshima having overcome devastation and radiation, Tsuboi has struggled against his disease and called for the total abolition of nuclear weapons as the theme for all human beings, to be accomplished either before or after his death; his words are heavily significant to Japan in the 21st century.